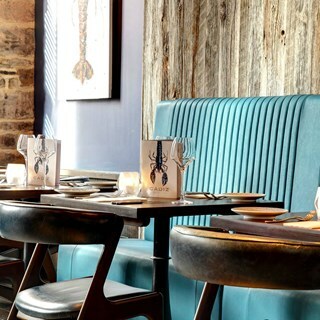 An exciting new seafood restaurant and cocktail bar in a 1st floor location above Cafe Andaluz, overlooking George Street. Cadiz will offer a wide selection of seafood dishes, prepared fresh daily using locally sourced produce where possible. We booked through Itison. I have been before but my husband hadn’t. Fantastic food, service, friendly and attentive staff. On top of that a free cocktail. Excellent value for money. Couldn’t have asked for more. Will definitely be back. We had the set 4 course lunch which had  a variety of choices and was excellent. We were having a catch up with friends and were not pressurised in any way to hurry our food to free the table, in fact we were there for well over 3 hours which was greatly appreciated. The friendly service and quality of food was excellent and we look forward to returning to a restaurant which has always been one of our favourites. We loved the food, thank you! Excellent food, would have liked better choice of Gin but wine was lovely. Great views, lovely atmosphere and very attentive staff. Excellent dinner. All four of us enjoyed each course which was well prepared and presented. Lovely fresh fish. Sufficient time in between courses also meant dinner was unrushed and pleasant without being slow. Staff were polite and attentive. Overall a great evening out for dinner. Nice food. Well presented. Not big portions but ideal for lunch. Fantastic lunch with my mum. Delicious cocktail to start followed by 3 stunning courses - the sea bass was cooked to perfection with beautiful crispy skin. My desert of lemon posset was divine. The staff were friendly, smiley and very helpful. Great experience! Very accommodating with our son. Lovely lunch, definitely will be back! Very enjoyable evening. Food very good (if bit rich for me) service was great. Fabulous as usual, some of my friends hadn't been before, so I'm sure you will get more clients. I had a great dinner with my family. The food was very tasty and the service impecable. Very welcoming and friendly staff. Good quality food too! Food was great. Service was alright however got there a little early and our table wasn’t ready so we’re seated at the bar which felt very hectic and stressful which was started to make us feel stressed. This dinner was for my mother’s 60th birthday and I had put it in the comments when booking the table so expected a little extra treatment - like some places that do a complimentary glass of Prosecco or dessert. I felt like this would have been really great as it’s a big birthday and we chose this restaurant for my mum to feel special. Absolutely loved our dining experience it was our first time we will definitely be back ! Three elements exceeded our expectations. The surroundings, table and decor were first class. The service was perfect by two happy, very knowledgable waiters. Then lastly the food. Excellent! My wife and I had a 4 course dinner and every course was exceptional. 5*. + scores the board. Thank you Cadiz. We had a beautiful meal at Cadiz and received great service throughout. Only reason I’ve marked down atmosphere is because we were seated in an area next to the kitchen so no view over George street. However it was quite interesting watching the chefs go to work. Would definitely return and recommend.